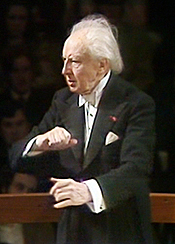 Leopold Stokowski, Symphony Orchestra. EMI 7243-5-57758-0-1 (2-disc set). 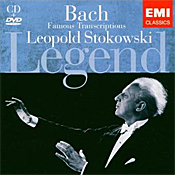 Leopold Stokowski was mere slip of a lad in his seventies when he made these recordings of Bach transcriptions in 1957-58 with his handpicked Symphony Orchestra. No doubt people still find his orchestral arrangements of works originally written either for solo organ or small baroque ensembles an acquired taste, to say the least; but they’ve been around for so long and people have come to know them so well, a lot of folks take them for granted as being entirely “Bach.” If you can keep from making that mistake, you’ll get more fun out of the music. This two-disc set contains a seventy-minute CD of eleven of his famous Bach arrangements, plus a DVD of a 1972 performance of Debussy’s Prelude a l’apres-midi d’un faune, recorded live with the London Symphony Orchestra at the Royal Festival Hall, London. More about that in a minute. First, let’s have a brief look at the Bach, which begins with the Passacaglia and Fugue in C minor, continues with things like the “Little” Fugue in G minor, the “Air on the G String” from the Orchestral Suite No. 3, the “Preludio” from the Violin Partita No. 3 among others, and, of course, the celebrated Toccata and Fugue in D minor to close the show. I prefer the old man doing the slower Bach items, Stokowski displaying a marvelous sensitivity and eloquence in the gentler music, although there is no denying that the big moments in the Toccatas come across with an excitement that is quite invigorating, too. Sure, the purists among us will continue to call Stokowski’s transcriptions corny or schmaltzy or commercial bastardizations of great music. Yet I’m not so sure that Bach himself wouldn’t have enjoyed them. Given the number of times Bach transcribed his own music for different instruments, I don’t think he’d mind what Stokowski did to it. Let’s put it another way: One should view Stokowski's arrangements of Bach as alternatives to the real thing, not as substitutes for them. One can go to the opera or symphony and still enjoy a good pop or rock concert. Well, some of us can. Best of all, EMI’s sound, now over a half a century old, is fairly good for its age--reasonably deep, firm, solid, and robust, somewhat compartmentalized perhaps, but well spread out across the stereo stage. I slightly prefer this sound in Bach to Stokowski’s later Phase-4 recordings for Decca, now also available on CD (in a five-disc box, which contains some really great things). Even though EMI’s late-Fifties’ sound may still seem highly engineered, it is a tad better focused and better imaged than Decca’s, if not quite so spectacular. Also, Symphony No. 5. Colin Jacobsen, violin; Jan Vogler, cello; Antti Siirala, piano; Eric Jacobsen, The Knights. Sony Classical 88725471762. I’m not sure the world really needed another recording of the Beethoven Triple Concerto. I know it didn’t need another Fifth Symphony. Nevertheless, if we have to have them, and apparently we have no say on the subject, I cannot think of many other groups I’d more like to hear doing them than The Knights. The Knights are a New York-based chamber ensemble, which, according to their Web site, is “an orchestra of friends from a broad spectrum of the New York music world who are deeply committed to creating original, engaging musical experiences.” Their stated goal is “to surprise audiences by constantly seeking new approaches to music-making and new exponents of the art form.” They strive “to play old music like it was written yesterday and inhabit new music in a way that’s familiar and natural.” Certainly, in the several albums I’ve heard by them (and reviewed), The Knights are accomplishing their mission. First up on the disc is the Triple Concerto in C major for piano, violin, cello and orchestra, Op. 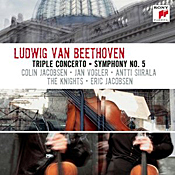 56, with soloists Colin Jacobsen, violin; Jan Vogler, cello; and Antti Siirala, piano; with Jacobsen’s brother and co-founder of The Knights, Eric Jacobsen, conducting. Beethoven wrote the Triple Concerto in 1804, and it has remained one of the composer’s most popular pieces ever since. It is, of course, actually a kind of orchestrated chamber trio, a sinfonia concertante where several instruments oppose the orchestra and each other, a style that had passed out of vogue by Beethoven’s time, although Beethoven was able to inject a little new life into it. I suppose you could say The Knights and their soloists also inject a little new life into the work. Despite The Knights’ ambition to seek “new approaches” and “surprise audiences,” their music-making is not in the extreme; the ensemble’s rendition of things is not so new as to be eccentric or bizarre. Indeed, their interpretations sound lively but conventional. This is Beethoven, after all, not some avant-garde composer they can play around with too much. You’ll find no excessively exaggerated tempos here, no inflated emphases or contrasts, no wilful hyperbole or embellishment for the sake of being different. I even hesitate using the word conventional to describe The Knights’ playing since the word may to some degree imply commonness, even mediocrity, in the performance, and nothing could be further from the truth. The Knights play with great enthusiasm and joy, communicating their delight in the music through their evident delight in the music-making. The Knights play the Triple Concerto in a quick and lively style, but not too quick or too lively. It seems just right, as a matter of fact. The three soloists perform well with one another, too, the cello dominant, of course, the piano perhaps a trifle large but never overpowering, the violin always holding things together. The instruments dart teasingly, charmingly, in and out of the musical structure. First and foremost, this music demonstrates a friendship and a kinship among the players, the three soloists and the orchestra accommodating that happy relationship sweeting and fondly. The Largo, which is brief anyway, the players take a bit more briskly than I might have liked. Still, they do the movement no harm, and it comes off with an appropriately serene air, leading smoothly into the exuberance of the finale. The Knights, too, attempt to seize things by the throat, imbuing it with an infectious excitement, particularly in the work’s grand conclusion. Yet it’s the performance’s opening movement that gives me pause. In a booklet note, oboist James Roe writes that “the first sound in Beethoven’s Symphony No. 5 in C Minor is silence. This monumental work begins with an eighth-note rest. Contained in that diminutive unit of silence is the last moment of calm before fate intervenes, the last second before learning life-changing news. It is the end of innocence before Beethoven’s infamous four-note motif launches the fateful first movement.” Fair enough. The trouble is that The Knights barely give anything in the opening minutes a unit of silence or even a chance to breath, they move along so quickly. To me the outset of the symphony appeared not so much powerful, dramatic, or turbulent as it did a trifle perfunctory. Nevertheless, once underway The Knights come into their own. Their natural spontaneity takes over, and they make the piece come alive. According to Beethoven’s own metronome markings, most recordings of the Fifth (well, most of Beethoven’s music actually) are too slow. Even though The Knights don’t attack the piece as some of the period-instruments crowd have, they do produce a fleet-footed interpretation filled with plenty of energy. The entrance into the final Allegro is thrilling, if perhaps lacking in the last bit of electricity generated by conductors like Carlos Kleiber and Fritz Reiner. All the same, not bad. The sound is pretty good, too. Sony recorded it in New York City over several days in January, 2012, and because of the reduced orchestral size, we get a reasonably transparent midrange, complemented by a soft, warm, ambient glow from the recording venue. There’s also a good separation of soloists in the Triple Concerto and a moderately lifelike integration of them with the rest of the orchestra. While I suppose there could have been a greater depth and dimensionality to the sound and perhaps a stronger, wider dynamic response, these are minor concerns when the playing has such multidimensionality. In the Fifth, however, we get what seems a tad closer response with a greater impact. 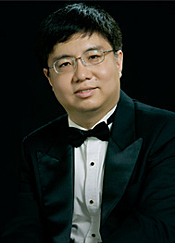 Yuan Sheng, piano. Piano Classics PCL0049 (3-disc set). Because Polish composer and pianist Frederic Chopin (1810-1849) was one of the world’s great writers and exponents of classical piano music, the listener will find a plethora of great recordings of his work. So any newcomer had better have something fresh and original to offer in order to compete with the likes of Maurizio Pollini, Arthur Rubinstein, Murray Perahia, Vladimir Ashkenazy, Krystian Zimerman, Tamas Vasary, Claudio Arrau, Van Cliburn, Vladimir Horowitz, Idil Biret, Daniel Barenboim, Garrick Ohlsson, Jorge Bolet, Earl Wild, and the like. But pianist Yuan Sheng and record company Piano Classics give it a decent shot. Why? Four solid reasons, actually: First, Sheng is a consummate pianist and puts on a most-accomplished and most-entertaining show. Second, Sheng consulted the Polish National Edition of Works by Freyderyk Chopin, edited by Jan Ekier, “in which many authentic yet never before published variants of passages in various compositions came to the public’s attention for the first time,” Sheng adopting the variants whenever possible. 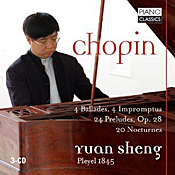 Third, Sheng studied the oldest possible recordings of Chopin’s music, recordings dating back to the late nineteenth century when the recording artists were still in direct contact with the composer, and learned from their performances. Fourth, Sheng plays the music on an original Pleyel grand piano built in 1845 and currently a part of the Frederick Historical Piano Collection in Ashburnham, Massachusetts. Chopin himself favored Pleyel pianos, saying “Pleyel’s pianos are the last word in perfection.” Whether Chopin played this particular piano I don’t know, but what is a matter of historical record is that Chopin owned a Pleyel of this same kind, which he used in his Paris home during his later life. And fifth, the sound quality Piano Classics obtained is quite good. So what we’ve got here is a set of well-played, historically informed, nicely recorded Chopin piano pieces that bear comparison to the best in the catalogue. Although I have to admit that Chopin’s four Ballades and four Impromptus on disc one are not among my absolute favorite of the composer’s tunes, they are certainly among Chopin’s more virtuosic and innovative pieces. As important, Sheng handles them with ease. Sheng is a sensitive pianist yet one who can work up a good head of steam, too. So, we get dreamy, ethereal sequences of supreme expression juxtaposed with melodramatic sections of great vigor. These works also give us our first chance to hear the Pleyel piano, which sounds slightly less rich than a modern piano while providing a wonderful attack, mellowness, resonance, and clarity, the acoustic venue further flattering the intimacy of the response. Among the Ballades, No. 3 stands out for Sheng’s sensible, balanced approach to the famous main melody and No. 4 for its cozy, flowing gait. Among the Impromptus, No. 4 demonstrates Sheng’s ability to make even so familiar a tune shine anew; the piece practically glows, it’s so lovely. The music on discs two and three is even more to my liking, Chopin’s twenty-four Preludes and twenty of his twenty-one Nocturnes, beautifully executed. Although the Preludes are very brief pieces, lasting no more than a minute or two each, Sheng brings a remarkable individuality to each of them. Then we come to the most-sublime, most-Romantic Chopin of all--the Nocturnes, eight of them on disc two and the remainder on disc three. Sheng plays them with a delicacy worthy of a Pollini, taking great care not to sentimentalize them, soften them, or make them sound too melancholy. The Nocturnes Nos. 2 in Opuses 9, 15, 27, and 32 come off as charmingly as anyone has played them, for all the straightforward manner Sheng brings to them, as well as Nos. 1 and 2, Op. 62. If there’s any minor concern about the set, it that’s it might be too much of a good thing. With three full discs of Chopin piano music, it may be more than some potential buyers want to have. I wonder if it might not have been an idea for Piano Classics to have offered each of the three discs separately or even as a single disc and a two-disc set, perhaps in addition to the three-disc set? Not everyone has the money for a big multi-disc collection, no matter how reasonably priced, nor the interest in all of the music. As I say, a minor issue. Anyway, recording engineer Christopher Greenleaf, the official recording engineer for the Historical Piano Concerts Series, made the music at a near-ideal venue for this type of affair, the Ashburnham Community Church, Ashburnham, Massachusetts, in 2010 and 2011. The room imparts a smooth, warm ambience to the piano playing, while still maintaining a fairly good lucidity. We get a most-inviting sound, especially as Mr. Greenleaf miked the piano at a moderate distance, providing a lifelike setting for the instrument. The church communicates a light, welcome sonority to enhance the realism. Violinist Rachel Podger, past leader of The English Concert, and regular collaborator with the Orchestra of the Age of the Enlightenment, leads Philharmonia Baroque Orchestra on a tour of virtuoso 18th century Italian concerti for one, two, and four violins. These concerts feature Philharmonia concertmasters, Elizabeth Blumenstock, Katherine Kyme, and Carla Moore, alongside Ms. Podger. On the program is Antonio Vivaldi’s spirited Concerto for Two Violins in A major, from L’estro armonico, as well as Arcangelo Corelli’s Concerto Grosso No. 1 in D Major, and Giovanni Mossi’s Concerto for Four Violins in G major. 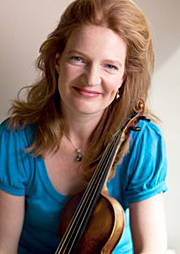 Rachel Podger was the leader of The English Concert from 1997-2002, frequently performing as the soloist in Vivaldi’s The Four Seasons, before becoming guest director at the Orchestra of the Age of the Enlightenment, which she led on an acclaimed tour with J.S. Bach’s Brandenburg Concertos. She appears as guest director and soloist with numerous Baroque music ensembles in the United States and Europe, and teaches at the Royal Academy of Music in London and the Royal Danish Academy of Music in Copenhagen. Ms. Podger performs on a 1739 violin made in Genoa by Pesarinius, a late student of Antonio Stradivari. The March edition of Philharmonia Baroque’s regular show on KDFC (90.3 San Francisco / 89.9 Wine Country / 104.9 San Jose) includes works by Vivaldi and other Italian composers - Sunday, March 10 at 8:00 PM. For more information, please visit www.philharmonia.org or call 415-252-1288 x. 315. Featuring some of the 18th century’s most thrilling violin music, Philharmonia Baroque Orchestra takes a whirlwind tour through the works of Vivaldi, Corelli, Pergolesi, and more. Led by Rachel Podger, an acclaimed interpreter of the Baroque period and guest director at Orchestra of the Age of Enlightenment, the concert also features Philharmonia concertmasters Elizabeth Blumenstock, Katherine Kyme, and Carla Moore. Tickets: Tickets start at $25. Elizabeth Blumenstock, viola d’amore; Debra Nagy, oboe d’amore; and the American Bach Choir are featured in a program of concertos and choral works. After a sensational start to the 2012-13 season with sold-out performances of Handel’s Messiah in Grace Cathedral, San Francisco, and intensely moving performances of Bach’s St. John Passion, the American Bach Soloists (ABS) turn their focus to concertos and psalm settings by the Baroque’s big three: Johann Sebastian Bach, George Frideric Handel, and Antonio Vivaldi. Maestro Jeffrey Thomas and ABS will present a pair of glorious choral works that represent the epitome of 18th-century Roman and Venetian traditions: Handel’s Dixit Dominus and Vivaldi’s Beatus vir. These exuberant works for soloists, chorus, and orchestra will feature the American Bach Choir, an ensemble that “sets the standard in choral singing” (San Francisco Classical Voice). Vocal soloists will include soprano Kathryn Mueller, mezzo soprano Danielle Reutter-Harrah, baritone Robert Stafford, and, in his ABS debut, countertenor Eric Jurenas. The instrumental portion of the program boasts two artists known for their abilities to communicate beauty and pathos through virtuosic performances. A frequent soloist and concertmaster with ABS, violinist Elizabeth Blumenstock is widely admired for her work with many of the finest period instrument ensembles in the country. Known for her “technical flair and melodic elegance” (San Francisco Chronicle), Blumenstock will be the soloist in one of Vivaldi’s enthralling concertos for viola d’amore, an exotic 12-stringed instrument with likely origins in Turkey or India. Vivaldi was a prolific composer of concertos—he wrote more than 500, including 350 for solo instruments, 230 of which were for solo violin—and this Concerto for Viola d’amore in D Major is a superb showcase for the instrument, rarely heard in solo concertos yet known for its especially beautiful timbre. Blumenstock performing as a featured soloist with ABS always generates thrilling musical results and this pairing of an exquisite composition and an extraordinary interpreter should not be missed. Oboist Debra Nagy will be featured in Bach’s Concerto for Oboe d’amore, BWV 1055, composed for a solo instrument that, in name and tone, conjures images of love, with its warm and deeply rich tone. Hailed for her “dazzling technique and soulful expressiveness” (Rocky Mountain News), and recognized as “a Baroque oboist of consummate taste and expressivity” (Cleveland Plain Dealer), Nagy lends her sensitivity as a musical communicator to Bach’s work, which was once feared lost. Reconstructed from a later version for harpsichord, Bach’s original composition for oboe d’amore soloist—with its jubilant outer movements and poignant Larghetto—is an ideal setting for a performer of Nagy’s virtuosity. A free, pre-concert lecture—“Insights”—by ABS oboist Debra Nagy will begin one hour prior to each performance. For tickets or information, please visit americanbach.org/tickets or call 415-621-7900. Friday, March 1, 2013, 8:00 p.m.
Saturday, March 2, 2013, 8:00 p.m.
Sunday, March 3, 2013, 4:00 p.m.
Monday, March 4, 2013, 7:00 p.m.
Pianist Jeffrey Kahane comes to Cal Performances on Sunday, March 10 at 3:00 p.m. in Hertz Hall, playing an eclectic mix of works from the 16th to 21st centuries. Kahane began his musical career as an acclaimed solo pianist in the early 1980s, and later that decade expanded into orchestral conducting, where he earned additional accolades. Of late, he has returned to the intimate setting of the solo piano recital. Kahane performs “with expressive warmth and fleet-fingered high spirits” (Los Angeles Times). Kahane’s program will lean heavily on the brilliant piano transcriptions of Franz Liszt. Liszt’s transcription for piano of J.S. Bach’s Organ Prelude and Fugue in A minor simulates the organ’s pedal parts with the left hand while retaining Bach’s intricate melodic figurations. Two other Liszt transcriptions—of Robert Schumann’s Widmung (Dedication) and Franz Schubert’s Auf dem Wasser zu singen (To be Sung on the Water)—cast these emotional lieder as equally heartfelt solo piano works. Another Schumann composition, the C major Fantasy, consists of three movements, the first of which is based on a motif from a Beethoven song cycle. The two works by New York–based musician (and Jeffrey’s son) Gabriel Kahane—Django: Tiny Variations on a Big Dog (commissioned by Jeffrey Kahane, the subject being the family dog) and Where are the Arms—were composed in the last five years. Pavel Haas’s Suite for Piano shows the Czech composer’s mastery of technique learned from his teacher Leoš Janá?ek, including the use of brief motives and folk-musical elements. Frédéric Chopin’s Barcarolle in F sharp Major is a transcendent, technically demanding example of a form—the “boat song” or “gondolier’s song”—that many composers wrote for 19th-century piano salons. Jeffrey Kahane was born in Los Angeles in 1956 and began studying piano at age five. He trained with Howard Weisel and Jakob Gimpel, graduated from the San Francisco Conservatory of Music, and in 1981 was a finalist in the Van Cliburn International Piano Competition. In 1983 he won first prize at the Rubenstein Competition and received the Avery Fisher Career Grant; in 1987 he won the first Andrew Wolf Chamber Music Award, and the next year made his conducting debut at the Oregon Bach Festival. He has appeared in recital and as soloist in major music centers throughout the United States, Europe, and Israel, and guest conducted orchestras and festival orchestras across the United States. He has also recorded widely, including works of Gershwin and Bernstein with Yo-Yo Ma. Kahane has been music director of the Los Angeles Chamber Orchestra since 1997, and in that capacity performed all five Beethoven piano concertos with the orchestra over two consecutive nights at the Hollywood Bowl in 2003—a feat he repeated twice in 2004. Kahane also served as director of the Colorado Symphony from 2005–2008, but a bout with hypertension—now controlled—led him to resign that post to focus more of his creative energy on piano performance. Tickets for Jeffrey Kahane, piano on Sunday, March 10 at 3:00 p.m. in Hertz Hall are priced at $42.00, subject to change. Tickets are available through the Ticket Office at Zellerbach Hall; at (510) 642-9988; at www.calperformances.org; and at the door. Half-price tickets are available for UC Berkeley students. UC faculty and staff, senior citizens, other students and UC Alumni Association members receive a $5.00 discount (Special Events excluded). For select performances, Cal Performances offers UCB student, faculty and staff, senior, and community rush tickets. For more information about discounts, go to http://calperformances.org/buy/discounts.php or call (510) 642-9988. Tickets: $42.00 subject to change, and are available through the Cal Performances Ticket Office at Zellerbach Hall; at (510) 642-9988; at calperformances.org; and at the door. Longwood Gardens today announced the ten talented organists who will compete in the inaugural International Organ Competition. The international performers will compete on the 10,010-pipe Longwood Organ for the $40,000 first prize. All contestants will compete in the preliminary rounds June 18-19, with the top five contestants competing in the final round on June 22. The competition takes place in the magnificent Ballroom at Longwood Gardens near Philadelphia, Pennsylvania. Tickets are available now at http://longwoodgardens.org/organcompetition.html. Daria Burlak, 27, was born in Vladivostok, Russia. She began studying piano at age five in Moscow and studied at the Moscow State Central Music School, at the Moscow Tchaikovsky Conservatory, and at the Cologne Conservatory of Music. Thomas Gaynor, 21, from Wellington, New Zealand, began his music studies at age 10 with piano lessons, moving on to the organ at 13. In 2004, he began an organ scholarship at St. Paul’s Cathedral in Wellington, New Zealand, a position he held for seven years until being awarded the title of Honorary Sub-Organist. James Kennerley, 28, a native of the UK, is working as an organist, conductor, singer, coach, and educator. Kennerley has been Organist and Music Director at the Church of Saint Mary the Virgin, Times Square, since 2008. Jinhee Kim, 27, of Seoul, South Korea, studied organ with Dr. Tong-Soon Kwak at Yonsei University in Seoul. She graduated with highest honors and was awarded both the university designated scholarship and the Yonsei Alumni Scholarship. Matthieu Latreille, 29, Quebec, Canada, received a Diplôme d'études supérieures en musique I from the Gatineau Conservatory of Music. In September 2005, he entered the organ class at the Montreal Conservatory, studying with Jean Le Buis. Baptiste-Florian Marle-Ouvard, 30, began studying piano in France at age 4. 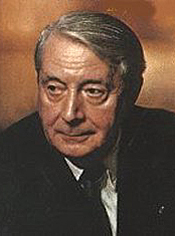 He later studied organ, conducting, composition and improvisation at Conservatoire National Supérieur de musique de Paris where he graduated with honours. Silviya Mateva, 27, of Plovdiv, Bulgaria, started studying piano at the age of seven and began her organ studies when she was 16. Yuri McCoy, 28, of Huntington, West Virginia, is a first year graduate student at the Shepherd School of Music where he studies with Kenneth Cowan. Adam Pajan, 26, a Monroeville, Pennsylvania native, is a DMA degree student in organ with a church music emphasis at the University of Oklahoma’s American Organ Institute where he studies with John Schwandt and is both a Graduate College Research Fellow and Graduate Assistant. Benjamin SheenBenjamin Sheen, 23, from London, UK, is a first year Master's student at the Juilliard School in New York, studying with Paul Jacobs. A distinguished panel of experts will judge the competition including Paul Jacobs, Chair of the Organ Department at The Juilliard School; Thomas Murray, Professor of Music at Yale University; Oliver Condy, Editor of BBC Music Magazine; Sophie-Véronique Cauchefer-Choplin, Titular of the Grand Orgue of Saint Jean-Baptiste de la Salle in Paris; and Peter Richard Conte, Grand Court Organist of the renowned Wanamaker Organ and Principal Organist at Longwood Gardens. Longwood Organ is among the world’s largest concert organs, with 146 ranks and 10,010 pipes. After a seven-year restoration completed in 2011, the organ is restored to its original 1930 condition and incorporates today’s most innovative technology. The winner receives the $40,000 Pierre S. du Pont First Prize, a contract with Phillip Truckenbrod Concert Artists, and a 2013-14 performance at Longwood. Second place receives the Firmin Swinnen $15,000 prize and third place receives the Clarence Snyder $5,000 prize. Swinnen and Snyder were past resident organists at Longwood. The Grammy-Award winning ensemble makes its U.S. debut with appearances in Washington, DC, Philadelphia, Boston, and New York March 18-21, 2013. Visionary composer and conductor Eric Whitacre and the Eric Whitacre Singers – winners of the 2012 Grammy for Best Choral Performance for their Decca debut album Light & Gold – will embark on a four city US tour this March, marking the first American appearances for the American Whitacre’s UK-based namesake ensemble. The tour is presented by Distinguished Concerts International (DCINY) a creative producing entity and a presenting organization with a long history of collaboration with Whitacre. The tour begins at the Music Center at Strathmore in Bethesda, MD (March 18) and goes on to Boston’s Symphony Hall (March 19), Philadelphia’s Kimmel Center (March 20), and finally New York’s Alice Tully Hall at Lincoln Center (March 21). The concert program, entitled Inspirations, will feature works from the Eric Whitacre Singers’ Decca recordings – including Light & Gold and 2012’s Water Night – alongside works by American composers Morten Lauridsen and John Corigliano and beloved works by Monteverdi and Bach. The polyglot composer leads Numinous in a pair of premieres commissioned by the postclassical music festival on March 16th at Merkin Concert Hall, New York City, NY. Joseph C. Phillips, Jr. will unveil his two new works at the Ecstatic Music Festival, presented by Kaufman Music Center, as well as a brand new collaborative piece with the soulful songstress Imani Uzuri. They will perform on March 16th at 7:30 pm at Merkin Concert Hall (129 W. 67th Street, New York, NY 10023). Tickets ($25; $15 Students with ID) can be purchased by visiting http://www.kaufmanmusiccenter.org/mch/event/ecstatic-music-festival-joe-phillips-imani-uzuri or by calling 212 501 3330. Brooklyn-based composer Joseph C. Phillips, Jr., an adamant proponent of individuality over genre affiliation, unlocks his earliest musical influences in Changing Same, a new piece commissioned by the Ecstatic Music Festival. The piece is also a central element for the forthcoming disc of Phillips’s music that is being planned for release by New Amsterdam Records. With a title inspired by Amiri Baraka’s seminal 1966 essay “The Changing Same (R&B and the New Black Music),” Changing Same acknowledges the black popular music that infiltrated Phillips’ childhood. “This piece is a philosophical and musical departure for me,” explains Phillips, who was struck by the indie/alt-classical scene’s penchant for art rock as source material for new chamber works and wanted to apply this sensibility to black vernacular music. Over the course of six movements, Schoenberg sidles up against Curtis Mayfield, Bach collides with Donny Hathaway, Prince gives way to Holst and the Love Train gets a joyous minimalist-tinged makeover. The result is a highly personal musical memoir that follows an emotional arc from youthful whimsy through existential despair and finally transcendent joy. As the Ecstatic Music Festival’s stock-in-trade is devising intriguing musical matches, Phillips will also be teaming up with the alluring, globally-minded vocalist and composer Imani Uzuri. Like Phillips, Uzuri’s eclectic style and musical versatility makes it impossible for her to be pigeonholed into any one genre. “We both make music that is hard to define and really embrace individuality,” says Phillips. “There’s also a clear spirituality in both of our music although we come at it differently.” If Phillips’s music evokes the cool aesthetic of a scientist beholden to the beauty of the universe, with the elegant scores to go with it, Uzuri’s is steeped in oral tradition and earthly passion. Their collaboration has resulted in a five-movement piece inspired by the themes of awe and humility that exploits these different perspectives, with Phillips setting a starry poem by Heinrich Heine and an excerpt from Jhumpa Lahiri’s novella The Namesake. For her part, Uzuri has set Mary Oliver’s poem “Peonies” and a self-penned text. The other piece on the program is an original multi-voice and multi-instrument musical suite by Uzuri titled Placeless, with orchestrations by Phillips. This work explores the loaded concept of “home” and makes use of the Psalms, the writings of Sufi mystic and poet Rumi and the folk hymnody African-American Spirituals. All music will be performed by Phillips’s chamber orchestra Numinous, which features some of NYC’s most intrepid and versatile musicians. The Ecstatic concert follows on the heels of a screening of Ernst Lubitsch’s recently restored silent film The Loves of Pharaoh, which featured Phillips’s critically acclaimed new score that was commissioned for the 2012 BAM Next Wave Festival, and To Begin the World Over Again, a collaboration between Phillips and choreographer Edisa Weeks that explored the revolutionary writings of Thomas Paine. After receiving rave reviews as Papageno in the San Francisco Opera’s recent production of The Magic Flute, Nathan Gunn fans have a chance to hear him perform in the intimate setting of First Congregational Church in Berkeley, CA, on Saturday, March 9 at 8:00 p.m. With his compelling stage presence and musical versatility, Gunn will give a program that blends classical and contemporary songs. The first half of the concert will consist of Franz Schubert and Robert Schumann lieder, while the second half will feature works by Samuel Barber, Charles Ives and William Bolcom. Gunn will be accompanied on piano by Julie Gunn, his collaborator and wife. “He brings all kinds of excellence to his work: musical intelligence, crisp rhythmic delivery and sensitivity to the text, impressive acting skills, and daring physicality” (The New York Times). Nathan Gunn was born in 1970 in South Bend, Indiana. After graduating from the University of Illinois he participated in the Metropolitan Opera’s Lindemann Young Artists Program and, at 24, won the Met’s National Council Audition. He has since won accolades and awards, including the 2006 Beverly Sills Career Grant and in 2008 was included in People magazine’s “The Sexiest Men Alive” list. Known for his dramatic talents, Gunn recently played the titular role in Billy Budd, a recording of which won the 2010 Grammy for Best Opera Recording. This season, Gunn will return to the Metropolitan Opera as Raimbaud in Le Comte d’Ory before heading to the Dallas Opera to play the Lodger in Dominick Argento’s The Aspern Papers. In addition to his opera roles, Gunn maintains a busy recital and concert schedule. He has appeared with the New York Philharmonic, San Francisco Symphony, Cleveland Orchestra, and the Chicago, Boston and London symphony orchestras. Recital appearances have been given at Alice Tully Hall and Carnegie Hall. Tickets for Nathan Gunn on March 9 at 8:00 p.m. at First Congregational Church are $56.00, and are subject to change. Tickets are available through the Ticket Office at Zellerbach Hall; at (510) 642-9988; at www.calperformances.org; and at the door. Half-price tickets are available for UC Berkeley students. UC faculty and staff, senior citizens, other students and UC Alumni Association members receive a $5.00 discount (Special Events excluded). For select performances, Cal Performances offers UCB students, faculty and staff, senior, and community rush tickets. For more information about discounts, call (510) 642-9988 or go to http://calperformances.org/buy/discounts.php. AOP and Opera on Tap showcase music from New Opera’s Decoration, Windows and Smashed. On Saturday, March 23, 7:30pm, AOP (American Opera Projects) and Opera on Tap will present a new installment of their acclaimed series, "OPERAtion Brooklyn" a semi-annual festival that highlights Brooklyn as the cultural epicenter for progressive works of opera and classical music. Audiences will be guided around multiple floors of ART-NY's South Oxford Space (138 S. Oxford St., Brooklyn, NY 11217) in Fort Greene, Brooklyn to hear music from new operas by local talents Mikael Karlsson, James Barry and Zach Redler. Tickets are $20, available at www.operationbrooklyn.com. The evening will run 1 hour, thirty minutes. From a prostitute who is desperately in love with her pimp to a teenage father whose baby will not stop crying, six short monodramas conspire to explore the diverse life situations of the individuals in Windows, a new work by composer Zach Redler and librettist Sara Cooper. The 40-minute staged song-cycle will feature performances by Sumayya Ali, Amelia Watkins, Jeffrey Gavett, Justin Hopkins, Brittney Redler, and Etai BenShlomo. Noah Himmelstein directs with Mila Henry on piano. Opera on Tap will present a preview of their latest project, SMASHED: The Carrie Nation Story, by James Barry and Timothy Braun, which premieres April 4-6 at HERE Arts Center in the Dorothy B. Williams Theater. Based loosely on the life and memoirs of temperance leader Carrie A. Nation, this absurdly comic opera about drinking booze (and about the people who don't) was commissioned by Opera on Tap for the inauguration of its Roadwork Series that creates operas in New York City that are subsequently presented by Opera On Tap chapters around the country. The OPERAtion Brooklyn preview will be conducted by Conrad Chu with stage direction by Jenny Lee Mitchell with Mila Henry on piano and performances by Patricia Vital, Seth Gilman, Joseph Flaxman, Michael Bragg, Cameron Russell, Christiana Little, Kayleigh Butcher, and soprano Krista Wozniak as the ax-wielding moral vigilante. Two sisters, one pregnant and one dying, confront rabbits, diapers and the end of time itself in Decoration, music by Mikael Karlsson, libretto by the composer and David Flodén. Presented by AOP, in collaboration with Manhattan School of Music, scenes from the opera will feature mezzo-sopranos Rebecca Ringle and Raehann Bryce-Davis, soprano Margreth Fredheim, and baritone Jason Cox, direction by Caren France, and Scott Rednour on the piano. The Beijing Guitar Duo is composed of Meng Su and Yameng Wang, who met at the Central Conservatory in Beijing, China, where they both studied with Chen Zhi. In 2006, they met Manuel Barrueco while he was on tour in Hong Kong. At his personal invitation, they applied and were accepted to the Peabody Conservatory of Music in Baltimore, where they continued their studies with Mr. Barrueco. At his recommendation, they formed their duo. Pre-concert talk at 7 p.m. with Benjamin Verdery of Yale University. Also, Cola di Rienzo Overture. 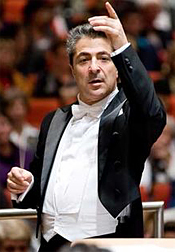 Francesco La Vecchia, Orchestra Sinfonica di Roma. Naxos 8.573007. 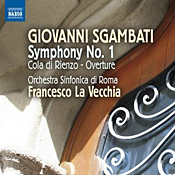 For more adventurous listeners (who don’t want to spend too much money to pursue their musical escapades), Naxos gives us some music by eighteenth-century Italian composer Giovanni Sgambati (1841-1914). Or maybe I should say Maestro Francesco La Vecchia gives us the music, as he seems determined to resurrect the tunes of as many obscure Italian composers as possible. In any case, you might find something of interest in Sgambati’s Symphony No. 1 in D major, Op. 16, and, who knows, if enough people show interest, maybe Naxos and La Vecchia will provide more of the man’s music. As I say, La Vecchia has done this sort of thing before, taking nineteenth and twentieth-century Italian composers who made a mark in their own day and then became largely forgotten and recording their music for twenty-first-century listeners. The names of Alfredo Casella, Giuseppe Martucci, and Gian Francisco Malipiero come to mind because La Vecchia did a whole series of Naxos albums recording these men’s work. Maybe La Vecchia just has a soft spot in his heart for underdogs. Anyway, here the conductor offers up two pieces by Sgambati, an overture and a symphony. Appropriately, the program begins with an overture, Cola di Rienzo, which the composer based on the same poem by Pietro Cossa that had earlier inspired Wagner. Sgambati apparently wrote his overture as part of some incidental music for the poem, but he never published the music in his lifetime, and it subsequently disappeared until just recently. This may be its première recording; however, perhaps in a bit of modestly, the Naxos notes don’t say anything about it. Whatever, the overture is fairly long at over eighteen minutes and made up of a string of individual, stand-alone segments that proceed in a rather dour, solemn pace, with hints of the aforementioned Wagner in the background. It becomes more colorful as it goes along and, thanks to La Vecchia, more dramatic, too. The centerpiece of the album is the Symphony No. 1, a five-movement affair consisting of a lively Allegro vivace; a dark Andante mesto; a cheerfully spirited Scherzo: Presto; a lovely and imaginative Serenata: Andante; and an elaborately embroidered Finale: Allegro con fuoco. Every section is melodious and rhapsodic, although it’s hard to discern any particular thematic centers to it nor remember much of it afterwards. While people like Toscanini and Wagner were fond of it (Wagner calling the composer “a true, great and original talent”), one can see why it never endured beyond its years. It’s all quite Romantic in style, with traces of Wagner again, Beethoven, Liszt and so on, even hints of Mendelssohn. Yet even though all of it is most pleasant, especially given La Vecchia’s loving attention, there is not a lot to take away from it nor a lot to draw one back. 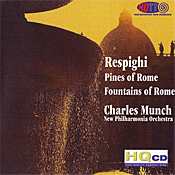 Naxos recorded La Vecchia and his orchestra in the Auditorium di Via Conciliazione, Rome, in 2011. The sound they obtained is very smooth, warm, and soft, typical of many Naxos recordings. One can hardly fault it, yet it never seems to carry the weight, clarity, or dynamics of an audiophile recording. The sonics exhibit decent orchestral depth, though, and a sweet hall resonance. Music of Rimsky-Korsakov, Glinka, Prokofiev, Borodin, Tchaikovsky, Liadov, Moussorgsky, and Khachaturian. 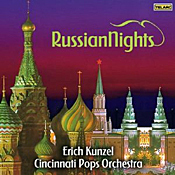 Erich Kunzel, Cincinnati Pops. Telarc CD-80657. Erich Kunzel and the Cincinnati Pops Orchestra pretty much took over where Arthur Fiedler and the Boston Pops left off, both conductors and orchestras among the most popular classical recording artists of all time. Of course, it would have been nice to hear Kunzel conduct a single piece that lasted more than a few minutes, but, alas, it would not be on this album, something like his eighty-third Telarc disc. This time Kunzel was doing Russian and Armenian composers, if not purely Russian or Armenian music. For example, the centerpiece of the album is Rimsky-Korsakov’s Capriccio Espagnol, which seems a little strange considering Telarc titled the disc “Russian Nights” and then features a composition of Spanish-inflected music. Oh, well; I suppose we get the idea. Almost everything on the disc is familiar territory, and while it is all neat and tidy, it is oddly flat. The performances seem to lack the last degree of flair and passion these red-blooded Russian works needed. The album reminded me that Georg Solti’s old collection of similar Russian showpieces exhibited more zeal and excitement than Kunzel brings to the table. Then, too, I couldn’t help thinking of Ataulfo Argenta’s 1956 rendition of the Capriccio Espagnol on a remastered LIM XRCD, a performance so overwhelmingly powerful and colorful, it was a hard act for Kunzel to follow. Anyway, here we get things like Glinka’s Overture to Russlan and Ludmilla, Prokofiev’s March from The Love for Three Oranges, Borodin’s “Polovtsian Dances” from Prince Igor, Tchaikovsky’s “Russian Dance” from The Nutcracker, and Moussorgsky’s Polonaise from Boris Godunov. They all sound appropriately showy, but my favorite pieces were the less flamboyant ones: Anatol Liadov’s The Enchanted Lake and The Music Box, and the star attraction, Aram Khachaturian’s “Love Theme” from the ballet Spartacus. This latter music demonstrates the disc’s wide dynamic range as well as the music’s wide emotional range. The sonics are quite spectacular if, as we’ll see, also problematic. I began wondering as I listened to the Khachaturian if the wide dynamic range were not in itself some of the cause for the music sounding slightly earthbound. One has to turn the softest passages up in volume to appreciate them, and then the loudest sections knock you out of your seat. Now, I’m all for a recording displaying a realistically wide dynamic range, as long as it’s within reason. The result here, though, is that for the most part, you’re listening at too low a level and nothing seems to come to life except now and again. Add to this the fact that the Telarc engineers recorded the whole show in the smoothest possible manner at a moderate distance, and you don’t quite get the up-front, in-your-face presentations that these war-horses demand. The fact is, in terms of replicating a live experience, the wide dynamics would indicate a close-up seating position, while the smooth, warm response would indicate a greater distance. The contrast is a tad disconcerting. Still, the Telarc disc provides good orchestral depth; good left-to-right stereo spread; typically good, if slightly overwrought, Telarc bass; some velvety polished highs; and those wide dynamics I mentioned. It’s almost, if not quite, enough. Also, Haydn: Variations in F Minor; Schumann: Symphonic Etudes. 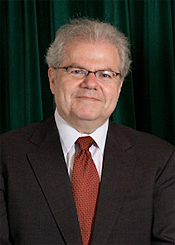 Emanuel Ax, piano. Sony Classical 88765 42086 7. At first glance, I couldn’t help thinking of Emanuel Ax as one of the new guard of emerging classical pianists. Then I remembered that his “emergence” was back in the early Seventies, when people were first giving him the recognition he deserved. So, on further reflection, I suppose he has now entered the ranks of the old guard, joining his elder colleagues Alfred Brendel, Vladimir Ashkenazy, Maurizio Pollini, Martha Argerich, Byron Janis, and the like in the pantheon of great pianists of our day. In any case, it’s always good to hear a new album by Mr. Ax, this time playing three sets of variations by three different composers. Ax begins the program with possibly the most-famous set of piano variations ever written, Beethoven’s Variations and Fugue for Piano in E-flat Major, Op. 35, “Eroica” (1802). The piece got its “Eroica” nickname because the composer based the main theme on that of the final movement of his Third Symphony, the “Eroica” Symphony, a theme Beethoven also used in some of his contredanses and in his ballet The Creatures of Prometheus. You might say he knew a good tune when he heard it. Although Beethoven originally planned to include thirty variations, he wound up with fifteen, plus the opening theme and a closing, summary finale, which Ax presents on the disc. Not surprisingly, given the pianist’s unassuming style, Ax gives us Beethoven in these interpretations rather than Ax. That is, he does not impose any idiosyncratic gestures of his own but keeps the music as close as I imagine Beethoven intended it. The more straightforward Ax plays, the more lovely the music becomes. This is despite the fact that many of the variations are quite exuberant and outgoing, which Ax happily accommodates. Indeed, Ax plays these variations about as well as I have ever heard them played: spirited, nuanced, but never showy in any grand manner. The playing is delightful, the final variation especially touching. In Joseph Haydn’s Variations in F Minor, Hob. XVII:6 (1793) we encounter a musical world apart from Beethoven, one filled with subtle contrasts. The actual variations are not nearly so obvious as Beethoven’s, and the overall impression is one of reserve and restraint. Ax plays them with great refinement, a quiet dignity that is most appealing. The album closes with Robert Schumann’s Symphonic Etudes, Op. 13 (1834-37), which are more Romantic sounding than either the Beethoven or Haydn sets, as we would expect. They also sound more complex, and Ax admits in a booklet note that they are difficult to play. Yet Ax performs them with clarity and polish, each of the variations exploring a different facet of piano playing. As a bonus, Ax includes five variations that Schumann left out of his original series. 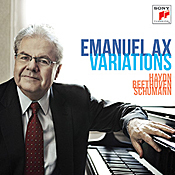 Emanuel Ax made these recordings at the Academy of Arts and Letters, New York City, in 2012. The engineers miked the piano at a comfortable distance, so the instrument does not stretch clear across the room; instead, it presents a lifelike width for a listener sitting a moderate distance away. The piano exhibits a dynamic response, a natural, lightly resonant acoustic providing a warm glow on the notes. Still, transients sound quick and sharply detailed, with strong, clear, sparkling impact. In other words, what we get is a most-realistic piano sound. The Music Institute of Chicago’s annual Four Score Festival, which highlights contemporary music, this year features the music of Frank Zappa, Frederick Rzewski and Michael Daugherty under the banner “Power to the People” March 10. The Festival begins with a special concert fundraiser March 3. In addition, the Music Institute showcases the winner of the Generation Next Young Composer’s Competition and other young composers in a free performance March 8. 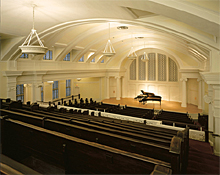 All performances take place at Nichols Concert Hall, 1490 Chicago Avenue, Evanston, Illinois. The March 3 benefit concert offers a relaxed and fun evening of music, conversation, food and wine. Performances feature Four Score Festival core ensemble members. As a highlight of the evening, Music Institute piano faculty member and Four Score Festival Director Abraham Stokman improvises on popular themes requested by the audience. All proceeds benefit the 2013 Four Score Festival. The first half of the March 10 concert features music by Frederic Rzewski, Janice Misurell-Mitchell, and Michael Daugherty. Abraham Stokman performs Rzewski’s Mayn Yingele and Down by the Riverside; flutist Janice Misurell-Mitchell performs her composition Everything Changes, joined by percussionists John Corkill and Christopher Jones; and the Academy Chamber Orchestra of the Music Institute’s prestigious Academy for gifted pre-college musicians performs Michael Daugherty’s Strut, conducted by Academy Director Jim Setapen. The second half of the program celebrates the 20th anniversary release of Frank Zappa’s album The Yellow Shark, which Zappa described as one of the most fulfilling projects of his career and the best representation of his orchestral works. A Four Score Festival faculty and guest artist ensemble, conducted by Jim Setapen, performs several works from this album of orchestral music. On March 8, a free concert showcases the Music Institute’s Generation Next Young Composer’s Competition, which encourages and promotes the development of young composers. The concert program includes Things I’d Like to Have for string quartet by first place winner Zara Ali (age 17, Cordova, Tennessee); Negotiation of the Winds for oboe, clarinet, and bassoon by second place winner Morgan Harry Kane (age 16, New Haven, Connecticut); and Metamorphosis, a piano solo by third place winner Robert Didier (age 18, St. Charles, Illinois). Receiving Honorable Mentions in the competition are Alex Yuill (age 18, Naperville, Illinois) and Blake Pilger (age 15, Rancho Palos Verdes, California). The program also will feature works from the Music Institute’s Composer’s Lab Program, created by Composer-in-Residence Mischa Zupko, and performances by young composers from the studios of Chicago-based guest composers Patricia Morehead and Ilya Levinson. Morehead’s student Brandon Anthony Bruscato (age 14) offers his work A nEw Fase for violin, clarinet, and cello, and Levinson’s student Josh Fletcher (age 22) has composed Deep Sea for French horn and piano. The Music Institute again has partnered with 98.7 WFMT to record the performance for future broadcast on the popular radio program Introductions, which celebrates talented pre-college classical musicians. The Four Score Festival’s benefit and main concerts take place Sundays, March 3 and 10 at 3 p.m. at Nichols Concert Hall, 1490 Chicago Avenue, Evanston, Illinois. Tickets are $30 for adults, $20 for seniors and $10 for students for each concert, available online or 847.905.1500 ext. 108. The Generation Next Winner’s Concert Friday, March 8 at 7:30 p.m. at Nichols Concert Hall is free. Eminent violinist Elena Urioste joins the National Philharmonic in Leonard Bernstein’s Serenade, a musical tribute to love’s power, on Saturday, March 2, at 8 pm at the Music Center at Strathmore, North Bethesda, Maryland. The program, led by National Philharmonic Music Director and conductor Piotr Gajewski, will also include Russell Peck’s Signs of Life II, Andreas Makris’s Violin Concerto and a world premiere of Steven Gerber’s Two Lyric Pieces. This project is supported in part by an award from the National Endowment for the Arts. Ms. Urioste brings her formidable talent to this concert featuring American works for violin. Showcased will be Leonard Bernstein’s Serenade, a five-movement concerto written in 1954 as a musical tribute to love’s power. Bernstein was inspired by Plato's Symposium, a dialogue of statements in praise of love, each made by a distinguished speaker. Although the Serenade is scored for violin, harp and percussion, the violin is the most prominent solo instrument. The concert also features Ms. Urioste playing Signs of Life II, by the late-American composer Russell Peck, featuring lush and invigorating music for string orchestra. The evening will also include the world premiere of Two Lyric Pieces by Steven Gerber, one of America’s most accessible contemporary composers, and the compelling Violin Concerto of the late-Washington, DC, composer Andreas Makris, who was a composer-in-residence for many years at the National Symphony Orchestra. Elena Urioste, recently selected by Symphony Magazine as an emerging artist to watch, has been hailed by critics and audiences alike for her rich tone, nuanced lyricism, and commanding stage presence. Since making her debut with the Philadelphia Orchestra at age thirteen, she has appeared as soloist with major orchestras throughout the United States, including the Boston Pops, National Symphony Orchestra, and Cleveland, Atlanta, Baltimore, New Mexico and San Antonio symphony orchestras. Ms. Urioste has collaborated with such acclaimed artists as pianists Ignat Solzhenitsyn and Christopher O'Riley, conductors Robert Spano and Keith Lockhart, and violinists Cho-Liang Lin and Shlomo Mintz. Elena plays a Michelangelo Bergonzi, Cremona (circa 1750). She is a two-time winner of the national Sphinx Competition, which honors outstanding young musicians of Latino and black descent. The National Philharmonic also offers exceptional and unique education programs, such as the Summer Strings and Choral Institutes. Students accepted into the Summer String Institutes study privately with National Philharmonic musicians, participate in coached chamber music and play in an orchestra conducted by Maestro Gajewski and Philharmonic Associate Conductor Victoria Gau. For more information, visit www.nationalphilharmonic.org. A free lecture will be offered at 6:45 pm on Saturday, March 2 in the Concert Hall at the Music Center at Strathmore. To purchase tickets to the American Virtuoso Violin concert on March 2 at Strathmore, please visit nationalphilharmonic.org or call the Strathmore ticket office at (301) 581-5100. Tickets are $28-$81; kids 7-17 are FREE through the ALL KIDS, ALL FREE, ALL THE TIME program (sponsored by The Gazette). ALL KIDS tickets must be purchased in person or by phone. Parking is complimentary. Robert Spano is known worldwide for the depth and intensity of his artistry, as well as his unique communicative abilities. Currently in his 12th season as music director of the Atlanta Symphony Orchestra, Mr. Spano is recognized internationally as one of the most imaginative conductors today. Since 2001 he has invigorated and expanded the Orchestra’s repertoire while elevating the ensemble to new levels of international prominence and acclaim. Mr. Spano recently brought his orchestra to Carnegie Hall in a performance of Bernstein, Copland, and Walton in October of 2012 to rave reviews. This spring he rounds out the season with two additional performances in the hall that are sure to highlight his distinguished abilities as a conductor, educator and pianist. He conducts the highly anticipated Osvaldo Golijov's La Pasión según San Marcos (St. Mark Passion) at New York's Carnegie Hall on March 10th. This performance will feature soprano Jessica Rivera, jazz vocalist Luciana Souza, members of the Venezuelan chorus to which the piece is dedicated, and high school singers from throughout New York City. Drawing on the sounds of Latin America with texts in Spanish, Latin, and Aramaic, the piece is evocative, wildly inventive, and entirely characteristic of Golijov's personal aesthetic. Mr. Golijov, well known for his wildly successful and critically acclaimed opera Ainadamar, is the holder of the 2012–2013 Richard and Barbara Debs Composer’s Chair at Carnegie Hall. As an educator who finds inspiration through his work with young musicians, Maestro Spano will join the Ensemble ACJW in partnership with the New York City Department of Education to present Messiaen’s Des canyons aux étoiles. Every two years, up to 20 of the world’s finest young professional musicians are chosen by application and audition as Fellows of the Academy. They are selected for their extraordinary level of musicianship, deep commitment to education and community engagement, and leadership qualities. On March 19th in Zankel Hall, Maestro Spano will lead this twelve movement work with featured pianist Juho Pohjonen, Laura Weiner, horn, Ian Sullivan, Xylorimba, and Jared Soldiviero, Glockenspiel. Robert Spano is one of the brightest and most inventive conductors of his generation. As Music Director of the Atlanta Symphony Orchestra, he has elevated the ensemble to new levels of international prominence. As Music Director of the Aspen Music Festival and School, he oversees the programming of more than 300 events and educational programs for 630 students, including Aspen’s American Academy of Conducting. Under Maestro Spano’s guidance, The ASO and audiences explore a creative programming mix, recordings, and visual enhancements. The Atlanta School of Composers reflects Mr. Spano’s commitment to American contemporary music. He has led ASO performances at Carnegie Hall, Lincoln Center, and at the Ravinia, Ojai, and Savannah Music Festivals. Guest engagements include the New York and Los Angeles Philharmonics, San Francisco, Boston, Cleveland, Chicago, and Philadelphia Symphony Orchestras, as well as Orchestra Filarmonica della Scala, BBC Symphony, and Amsterdam’s Royal Concertgebouw Orchestra. He has conducted for Covent Garden, Welsh National Opera, Lyric Opera of Chicago, Houston Grand Opera, and the 2005 and 2009 Seattle Opera Ring cycles. With an extensive discography of 21 recordings for Telarc, Deutsche Grammophon and ASO Media, Robert Spano has garnered six Grammy Awards. Dedicated to pedagogy and multi-disciplinary studies, he completed a three-year residency at Emory University, is on faculty at Oberlin Conservatory, and has received honorary doctorates from Bowling Green State University, Curtis Institute of Music, Emory University and Oberlin. In May 2009, Spano was awarded Columbia University's Ditson Conductor's Award for the advancement of American music. Robert Spano is proud to live in Atlanta. Tickets are now on sale for the 2013 American Bach Soloists Festival at the San Francisco Conservatory of Music, July 12-21, 2013. This season’s two-week festival offers a considerable line-up of concerts, lectures, and master classes that allow patrons the chance to immerse themselves in the music and culture of the Baroque. The rich array of events, including many free attractions, have made the ABS Festival & Academy—San Francisco’s Summer Bach Festival—one of the most appealing summer music festivals in the United States. This year ABS artistic and music director Jeffrey Thomas will lead the ABS orchestra, “some of the greatest period-instrument players in the world” (San Francisco Classical Voice), in authoritative performances of the best of the Baroque repertory including the West Coast premiere of Heinrich Ignaz Franz von Biber’s gargantuan opus Missa Salisburgensis (July 13), Handel’s dramatic oratorio Esther (July 19), and two performances of a festival tradition and ABS specialty, J.S. Bach’s sweeping masterwork Mass in B Minor (July 14 & 21). This season’s Distinguished Artist Series (July 20) will feature a recital by renowned Baroque virtuoso Tanya Tomkins, “a cellist with a very special and unusual intensity” (Cleveland Plain Dealer). Ms. Tomkins will perform an intimate program of solo and chamber works. Tickets for the ABS Festival & Academy may be purchased online at sfbachfestival.org or by calling (415) 621-7900. All-inclusive Festival Pass subscription packages (8 concerts) range from $100-$204 and single tickets are available from $20-$60. Academy-in-Action concerts featuring participants in the ABS Academy—the educational component of the Festival—are $10, but Festival Pass subscribers attend these concerts for free. All Festival events will take place at the San Francisco Conservatory of Music, 50 Oak Street, San Francisco, 94102, near the Civic Center BART and Van Ness MUNI stations. For more information, visit americanbach.org or call (415) 621-7900. A Cal Performances’ favorite, the Brentano String Quartet, returns to Berkeley’s Hertz Hall on Sunday, March 3, with a program of chamber music classics. The quartet, made up of Mark Steinberg (violin), Serena Canin (violin), Misha Amory (viola) and Nina Lee (cello), is known for performing with “an almost unearthly level of perfection” (The Times, London). Their concert will include Joseph Haydn’s String Quartet Op. 33, No. 2; a group of Henry Purcell’s Fantasias; Béla Bartók’s Quartet No. 4; and Ludwig van Beethoven’s Quartet in E-flat Major, Op. 74, No. 2. Additionally, the ensemble can be heard playing Beethoven’s String Quartet No.14, Opus 131, in the critically acclaimed film A Late Quartet starring Philip Seymour Hoffman, Christopher Walken, and Catherine Keener; Nina Lee plays a cameo role as herself in the film. The Brentano String Quartet was formed in 1992. The group takes its name from Antonie Brentano, considered by many to be Beethoven’s “Immortal Beloved,” the intended recipient of his famous confession of love. The Quartet first rose to prominence by winning the first Cleveland Quartet Award and the prestigious Naumburg Chamber Music Award and has been praised by The New York Times for its “tight interplay and beautiful hues.” The ensemble is also internationally renowned for its stylistic elegance and deep insight and has performed on many renowned stages, including Carnegie Hall, Alice Tully Hall, Wigmore Hall, Sydney Opera House, and Royal Concertgebouw. In addition to standard quartet repertoire, the ensemble performs many works that pre-date the string quartet as a medium, including works by Gesualdo, Purcell and Josquin. The group is also interested in new music and has commissioned works by contemporary composers Charles Wuorinen, Bruce Adolphe, John Mackey, David Horne, and Gabriela Frank. Distinguished collaborators include soprano Jessye Norman and pianists Richard Goode and Mitsuko Uchida. Their discography includes a recording of the Op. 71 String Quartets of Hayden and a Mozart album for Aeon Records, as well as contemporary works. Violinist Mark Steinberg is both an active chamber musician and recitalist. He has participated for four summers in the Marlboro Music Festival, with which he has toured extensively. He has also been a soloist with the London Philharmonia, Los Angeles Philharmonic and Philadelphia Concerto Soloists in addition to working with conductors Kurt Sanderling, Esa-Pekka Salonen, and Miguel Harth-Bedoya. Violinist Serena Canin is an accomplished chamber musician who has toured the United States with Music From Marlboro, Brandenburg Ensemble and Goliard Concerts. She holds teaching positions at Princeton University and New York University. 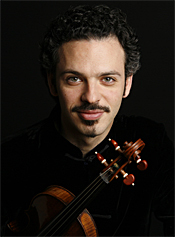 Violist Misha Amory won the 1991 Naumburg Viola Award and has been an active solo and chamber performer ever since. He has released a recording of Hindemith sonatas on the Musical Heritage Society Label. Amory is a faculty member of both the Juilliard School of Music and the Curtis Institute in Philadelphia. Nina Lee, cellist, has performed at Tanglewood and Marlboro Music Festivals and has toured with other musicians as part of Musicians from Marlboro. She currently teaches at Princeton University and Columbia University. Tickets for Brentano String Quartet on Sunday, March 3 at 3:00 p.m. at Hertz Hall are $46.00, and are subject to change. Tickets are available through the Ticket Office at Zellerbach Hall; at (510) 642-9988; at www.calperformances.org; and at the door. Half-price tickets are available for UC Berkeley students. UC faculty and staff, senior citizens, other students and UC Alumni Association members receive a $5.00 discount (Special Events excluded). For select performances, Cal Performances offers UCB student, faculty and staff, senior, and community rush tickets. For more information about discounts, go to http://calperformances.org/buy/discounts.php or call (510) 642-9988. Sunday, March 3, at 3:00 p.m.
Sonoma State University President Ruben Armiñana today announced the appointment of Emmanuel Morlet as Artistic Director of the Green Music Center (GMC). Morlet, a native of France, is currently Director of the Music Office for the Cultural Services of the French Embassy and a Program Officer of the French-American Cultural Exchange (FACE) Foundation in New York. He begins his new position on April 1, at which time he assumes responsibility for all artistic programming at the complex. As artistic director at the GMC, Morlet will be responsible for setting the Center’s artistic vision and programming, working closely alongside newly appointed Executive Director Larry Furukawa-Schlereth. He will also be actively engaged with GMC leadership and its donor community, and will oversee collaborations between the University and the Center. Since 1998, Morlet has served at the French Embassy overseeing multiple offices nationwide, supervising all music-related activities, working directly with artists and ensembles, and fundraising to support these efforts. 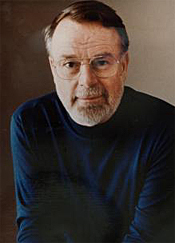 An accomplished musician, Morlet was responsible for programming across a number of genres including classical, jazz, popular, world, and electronic. Among the many projects he coordinated in conjunction with universities, festivals, and international venues, Morlet led all aspects of “Sounds French,” a month-long festival of contemporary music, and is co-founder of the acclaimed annual “GlobalFest” world music festival. A citizen of both France and the United States, Morlet studied at the University of Paris-Sorbonne and Blaise Pascal University in Clermont-Ferrand, where he majored in French literature while also studying communications, music, and arts administration. “Emmanuel is the ideal person to serve as our artistic director. His unique background of bringing different cultures together through music and the arts bodes for an exciting future as we continue to attract the world’s best artists to our widely acclaimed venue. He and his family will be a terrific addition to the Sonoma County community and we look forward to welcoming them and working together,” said Sandy Weill, Chairman of the GMC Board of Advisors. “I want to thank our campus committee of faculty, staff, and student representation, as well as the GMC Board of Advisors who conducted an extended search for the artistic director position, said Executive Director Larry Furukawa-Schlereth. Furukawa-Schlereth will carry on in his role as executive leader of the GMC, working alongside the Board of Advisors and overseeing the staff and operations of the year-round performance center. Nestled in the picturesque foothills of Northern California’s esteemed wine country, the GMC is a focal point for arts in the region, with its spectacular 1400-seat Weill Hall. A program of Sonoma State University (SSU), the GMC’s inaugural season launched in fall 2012 with an international array of top classical, jazz, and world music presentations. Earlier this year, a first-of-its-kind collaboration was announced between SSU and The Academy, a program of Carnegie Hall, The Juilliard School, and the Weill Music Institute, in partnership with the New York City Department of Education. Montpellier National Opera and Symphony Youth Choral conductor Valerie Sainte-Agathe has been appointed Music Director and Principal Conductor. The Board of Directors of the five-time Grammy Award-winning San Francisco Girls Chorus (SFGC) has announced its new artistic leadership. Composer-vocalist, long-time member of the Philip Glass Ensemble, seasoned choral music veteran and SFGC alumna Lisa Bielawa has been named Artistic Director, and Valerie Sainte-Agathe, former Musical Director for the Junior Opera and Young Singers program of the Montpellier National Symphony and Opera in Montpellier, France, will serve as Music Director and Principal Conductor. Bielawa will oversee the artistic vision and programming of the Chorus, forge compelling partnerships with other organizations and artists, engage audiences and uphold the highest standards of excellence and innovation for the 35-year-old Chorus. She will hold the primary responsibility for long-range artistic planning and programming for specific performances, collaborations, tours and recordings for Chorissima, the premier performing ensemble of the San Francisco Girls Chorus. Sainte-Agathe will conduct performances of Chorissima, develop the overall musicianship of its young artists focusing on vocal technique, music theory and history, as well as teaching and preparing repertoire for performances. She will work collaboratively with Ms. Bielawa in planning concerts, collaborations, tours and recordings for Chorissima. Bielawa will divide her time between New York and San Francisco. These appointments culminate a year-long search and a multi-year strategic planning process. For more information about the San Francisco Girls Chorus, visit www.sfgirlschorus.org. Natasha Hoehn, Chairman of the San Francisco Girls Chorus Board of Directors and SFGC alumna said, “We are pleased and honored to welcome Lisa Bielawa and Valerie Sainte-Agathe to the San Francisco Girls Chorus. Their roles, experience, dedication and energy perfectly match our vision and goals to be an outstanding performing ensemble made possible by a unique and rigorous choral training program pursuing collaborations, commissions with prominent artists and ensembles and creating opportunities for touring, recording and other projects. Sainte-Agathe says, "I am delighted to conduct the renowned San Francisco Girls Chorus. In my years of conducting and teaching young singers in France, I have greatly enjoyed preparing talented young musicians for opera and choral performances and I am eager to begin working with such a highly accomplished ensemble as the Girls Chorus."